Software prodigy Josie Ashkenazi has invented an application that records everything its users do. When an Egyptian library invites her to visit as a consultant, her jealous sister Judith persuades her to go. But in Egypt’s postrevolutionary chaos, Josie is abducted—leaving Judith free to take over Josie’s life at home, including her husband and daughter, while Josie’s talent for preserving memories becomes a surprising test of her empathy and her only means of escape. A century earlier, another traveler arrives in Egypt: Solomon Schechter, a Cambridge professor hunting for a medieval archive hidden in a Cairo synagogue. Both he and Josie are haunted by the work of the medieval philosopher Moses Maimonides, a doctor and rationalist who sought to reconcile faith and science, destiny and free will. But what Schechter finds, as he tracks down the remnants of a thousand-year-old community’s once-vibrant life, will reveal the power and perils of what Josie’s ingenious work brings into being: a world where nothing is ever forgotten. This is another one of those books where I'm just torn. There are things I quite liked about this book and others that either just fell flat or that I just didn't "get." 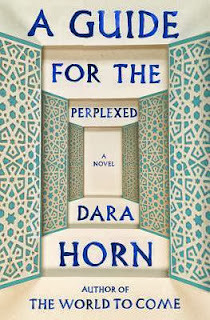 I really enjoyed Horn's writing style. She is able to tackle some complex subjects--in this case, Jewish theology--in a way that someone who is only minimally familiar with it can understand. She also paces this book quite well, which is quite a feat because there are three distinct stories. The main story of Josie and Judith interested me the most. For one thing, the bulk of the action happened here and it had the most developed characters. Honestly, if this book had just been about this story I would have been a happy and satisfied reader. I felt sort of like the dumb kid in class who just doesn't understand it. What am I missing? Is it because I'm not Jewish, or I don't have a sister, or don't have asthma? In the end, A Guide for the Perplexed just left me perplexed. 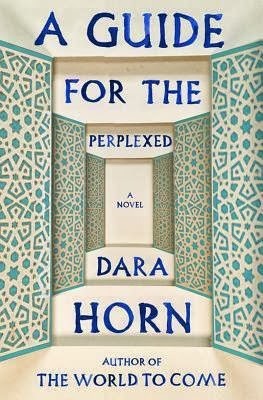 I won a copy of this book through the GoodReads First Reads program. I was requested, but not required, to post an honest review. I received no other compensation for this post.